Black and Decker Coffee Maker Reviews: Are They Worth Buying? Home Brands Black and Decker Coffee Maker Reviews: Are They Worth Buying? The Black and Decker Coffee Maker Reviews – Are These Machines Worth Buying? Coffee - it’s not just for breakfast anymore. There’s something so satisfying about the morning ritual of brewing a fresh pot of coffee. The aroma, the warmth, the favorite mug, the anticipation of the jolt of energy as you get ready to tackle the day. All of these things coming together to create a perfect moment - even if it only lasts for thirty seconds. It doesn’t matter to the coffee lover - it’s still a moment that we look forward to day in and day out. This daily ritual of brewing coffee can be so comforting, so simple. Perhaps that’s one of the many reasons why so many people need their coffee. And apparently, it’s not just the taste of coffee that is loved so deeply either. There is a huge market for at-home brewing machines. And with many different ways to brew a cup of coffee, comes even more (very strong) opinions on which method results in the best cup. Many coffee connoisseurs swear by their particular method. 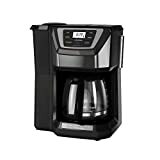 So, before we look specifically at the Black and Decker coffee maker reviews, let’s briefly discuss the types of coffee makers available for the perfect cup of java you can brew for yourself. The Black and Decker Coffee Maker - What Makes it Different? How Are the Black and Decker Machines Priced? The Black and Decke1r Coffee Makers – What Do We Think? 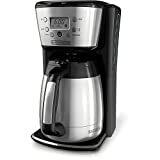 Each method of brewing has its pros and cons but the focus of this article is specifically about the Black and Decker brand of coffee makers. 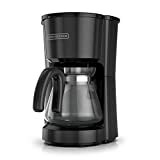 The Black and Decker line of coffee makers falls within the automatic drip category. Maybe you’re on the fence about the automatic drip coffee makers or maybe you have already decided this is best type of coffee maker for you. You want the convenience of being able to pour water, press a button and get your coffee. You may even feel inclined to set the timer before you go to bed so the coffee will be waiting on you when you wake up. Users of the automatic drip machines also like that it keeps their coffee warmer longer. You don’t have to worry about transferring it to a different carafe or reheating the coffee. And many people like how easy the drip machines are to use. You can start using the machine practically right out of the box. Depending on which machine you purchase, you can even adjust the brew strength or temperature with just the touch of a button. Now that you’re sold on the automatic drip machines, now you have to figure out which brand to go with. One trip to the store or search online and the selection can start to be overwhelming. But maybe somewhere in your search you’ve noticed that Black and Decker has a complete lineup of coffee makers. You’ve noticed that there are lots of different options even if the budget isn’t very large. What makes Black and Decker different than all the other brands? To begin with, Black and Decker has quite the selection to choose from. Whether you are looking for the very basic, least expensive model or looking for one that has several convenience features. The Black and Decker lineup is geared towards the consumers who are looking for the most value possible no matter how small their budget is. Whether it’s $20 or upwards of $80, you’re bound to find something that is priced to fit within a budget. As mentioned previously, the Black and Decker coffee makers are targeted towards the consumers who are looking for a value - priced machine. You will find several different models to choose from under the Black and Decker name. It’s also important to note, there are several coffee makers that are found exclusively at certain stores. The lineup starts with this basic machine. If you need something more compact and won’t take up too much space on your counter, then the 5 – Cup version could be for you. Features include Sneak – A – Cup™ Technology (so you can pour a cup even before the brewing has completed) and the 5 – cup Duralife™ Carafe. Also includes the washable brew basket and a lighted on/off switch. The price for this machine is around $20. This is another basic model within the lineup that also starts around $20. The QuickTouch Programming buttons allow you to set the 24-hour auto brew feature. Other features include Sneak – A – Cup™ Technology (so you can pour a cup even before the brewing has completed). It also includes the 12-cup Duralife™ glass carafe, and a washable brew basket, and available in black or white. Perhaps you’re looking for a coffee maker that has a couple of additional features compared to the basic models. For $29.99 you can get everything the CM1060 has to offer but the CM1160 also has digital controls. This model also includes the two - hour shut-off feature. Perhaps you want all the features with the CM1160 but need a hot plate to keep your carafe warm for two hours. This model is also available in black or white. The DCM100B is priced at $27.99. For $39.99, the CM4200S offers a dial function to select the number of servings you need to brew at one time. Plus you can adjust your brew strength and start to customize how your coffee is being made. Also included is an extra large water reservoir (80 oz) which allows you to store water and not have to fill up your coffee maker quite as often. For $49.98, the CM2036S will include several additional features. The stainless steel carafe promises to keep your freshly brewed coffee warm for up to two hours. The display for this model is a bright, LCD display and includes all digital controls. The CM2036S also allows you to customize your brew strength. If you want the most options from the Black and Decker lineup that your money can purchase, then the CM5000GD is the model that offers the most features. With this model, you’ll be able to grind your beans within the coffee maker. This will not only give you the freshest tasting coffee but you’ll have all the convenience in one machine. The CM5000GD is priced around $79. It’s also available in black, gray, white or red. How Do the Black and Decker Coffee Makers Compare to the Other Automatic Drip Machines? This is where the choices start to get a little overwhelming. A quick search and it won’t be long until you see how many choices there are in the coffee maker world. Especially when it comes to the automatic drip machines. Hamilton Beach, Mr.Coffee, Cuisinart, Proctor Silex, Braun – this is just scratching the surface of the number of brands you can sort through. One noticeable difference between the Black and Decker coffee makers and the other brands is its design. The Black and Decker’s have a very round shape. You won’t see too many clean lines on these machines. Other brands might utilize square edges and sharper lines. Lastly, compared to most other brands, Black and Decker will be priced less while still having a competitive set of features on the machine. Overall, the reviews for the various Black and Decker products are fairly positive. You will also find a great number of reviews available, especially considering the vast number of coffee makers under the Black and Decker name. Most consumers cite the value of the product as being the main reason they enjoy these coffee makers. Whether it’s the compact design of the 5 – cup version or the 12 – cup Mill and Brew, there appears to be a real value. Most consumers feel they are able to get a respectable machine for a fair price. The convenience of several of the features, the simplicity of the design, and ease of use - these are the main reasons purchasers give the Black and Decker coffee makers positive reviews. Other reviews love the taste and temperature of the coffee once it’s brewed. The machine yields a great tasting cup of coffee according to the ones who have purchased it. Other reviews worth taking into consideration involve the quality of the glass carafe. A good number of the reviews that are less than flattering actually suggest that the carafe isn’t very durable. There are many comments about trying to find the replacement carafe because the original has already cracked or broken. There are multiple reports of the glass carafe breaking after normal use or an accidental tap. The other negative feedback these products consistently receive are that the units simply stop working after a few months of use. Some reviews said after one month, others claimed after a year. Between the carafe breaking and the unit suddenly stopping, it does cause further questions about the overall quality of the coffee makers. But overall, for the amount of money spent, most people seem satisfied in their purchase of one of these machines. The Black and Decker Coffee Makers – What Do We Think? 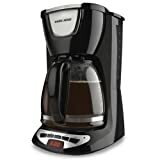 If you are looking for a simple automatic drip coffee maker that doesn’t require a large financial investment up front and is easy to operate, then the Black and Decker is worth considering. Sure the reviews about the carafe cracking and the quality of the units are a little concerning. But when you factor in the total investment and the convenience the machines have to offer, then the Black and Decker is a decent choice. One thing is certain, there is definitely an extensive selection of products to choose from. Black and Decker has tried to make it as easy as possible to find a model that works best for your lifestyle and coffee needs - even if you have a small budget. If value is the most important feature to you in a good cup of coffee then the Black and Decker coffee maker is definitely a good option for you. What do you think? Have you ever purchased a Black and Decker coffee maker? If so, tell us what your experience was like.